More than eight in 10 Americans are stressed about their jobs. Occupational stress is so pervasive that we accept it as a fact of life, but the truth is that demanding jobs do more than make us unhappy -- they can also spur some serious health consequences. Chronic stress in general has been linked with a number of negative health issues, including poor sleep quality, depression, weight gain and an increased risk of developing a number of chronic diseases. And studies looking particularly at work stress show that there are a number of physical and mental effects unique to on-the-job strain. If you're part of that blissful 17 percent of the population who say that nothing about their job stresses them out, congratulations. 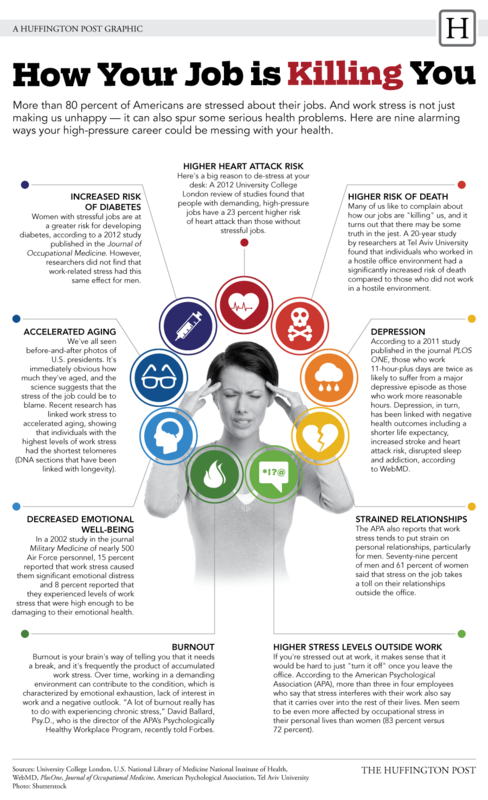 But for the rest of us, check out the infographic below for some of the scary ways your high-octane career could be affecting your health. If this research doesn't make you want to leave it all behind to teach yoga or travel the world, we don't know what will.